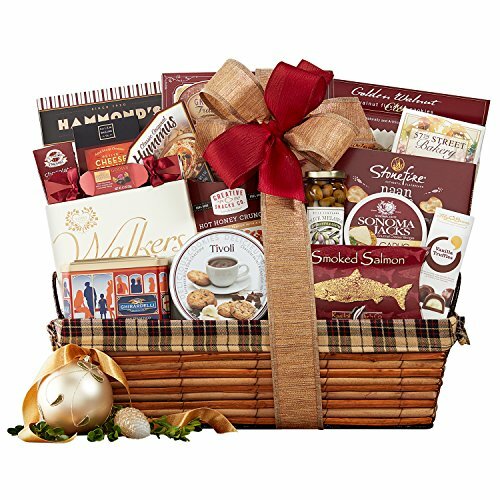 This gift basket is perfect for loves ones, family, and friends who love a gourmet feast of snacks and treats. You can't go wrong with this large assortment. Fully loaded with smoked salmon, mozzarella cheese swirls, roasted garlic crackers, Lily O'Brien's chocolate chip cookies, English tea, olives, Rocky Mountain Chocolate Factory toffee chocolate chip cookies, garlic herb cheese spread, almond tea cookies, lemon cream cookies, vanilla caramels, green and black olive tapenade, Popcornopolis kettle corn, peanut crunch, garlic & chive bagel chips, hot cocoa and more.